Headset and call recording options are available for those wishing to keep a record of conversations. All models contain wireless modems enabling Internet, email access and DIY firmware upgrade. Models in the range are capable of working on GSM/GPRS/EDGE and 3G UMTS/HSDPA networks. How does it compare to a handheld mobile phone? How does it compare to a handheld mobile phone? Anyone can install it and use it without having to read a manual. Just pick up the handset and dial. When it rings - just pick up the handset or press the HANDS FREE key. The large keys are easy to see and select without making a mistake. The characters are larger and easier to read on a large backlit screen. A call comes in but its not for you. No problemjust press hold and dial the other persons number and press hold again. The call is then tromboned back to the network. Connect the phone to your PC via USB and use CRM applications like Goldmine, SAGE ACT, Microsoft CRM or Maximizer to do the dialling for you. No need for uncomfortable and poor sound quality in-ear adaptors. Just connect the optional in line mike to any sound recording equipment for a perfect archive . A permanent, shareable and reliable resource. It normally stays in the same place on the same desktop or wall. So unlike a 'personal' mobile phone it can always be found. Everybody knows where it is - so everyone can use it to make and take calls. It's much less vulnerable to being damaged or stolen. Wall mount bracket prevents removal of phone and SIM. You can copy your SIM phone book to the phone. The external aerial is much more efficient than a mobile phone aerialso its able to work in areas of interference or where handhelds refuse to work. By locating the aerial away from your head any possible risk to your health is considerably reduced. P350 offers CSD speeds at 14.4Kbps and P390 offers in addition GPRS up to 86Kbps. How does it compare to a landline phone? Will work anywhere within mobile network coverage. 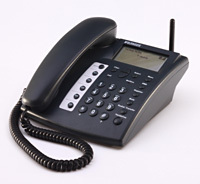 Ideal for use in locations where landline telephones or services are expensive, uneconomic or can never be provided. How does it compare to a landline phone? Quicker and cheaper to install. No endless waiting and expense to install a landline. Anyone can get it working in minutes. Ideal for use in temporary locations like rented offices, exhibitions or in any location within mobile network coverage. By using a SIM on an inclusive minute cross network tariff calls can cost as little as 0.5p/min during peak hours. Calls to and from other group tariff mobiles on the same network can be free and unlimited, making it ideal for use as the 'office' telephone.